Our Bella Canvas women's v-necks are made from a 50% cotton / 50% polyester blend and are available in five different sizes. All women's v-necks are machine washable. 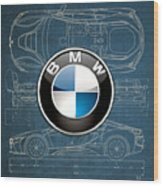 There are no comments for B M W 3 D Badge Over B M W I8 Blueprint . Click here to post the first comment. Love it but the size runs small. I absolutely love this shirt!! However, I need to loose some weight I ordered an XL thinking it would be just perfect but it turns out it is more like a medium Thanks! I ordered this item for a soecial event. I was thrilled to have it come the day before. I ordered an adult 2x and the shirt, although stated it was so, appeared to have been better suited for a 10yr old. I wound up giving it to someone else . I'm disillusioned but choose to see it as a blessing for someone else. The shirt was beautiful and well done. But, the sizes are way off. I ordered an XL, received a shirt that indicates it is XL, but it was more like a medium. Don't know what to do now. Introducing the �Wheels of Fortune� collection by Serge Averbukh, showcasing digital paintings of some of the coolest and most sought after automobiles of past and present along with amazingly digitally crafted car makers� insignia and badges (logos). Here you will find framed and wrapped/stretched canvas fine art prints, featuring BMW 3D Badge over BMW i8 Blueprint. 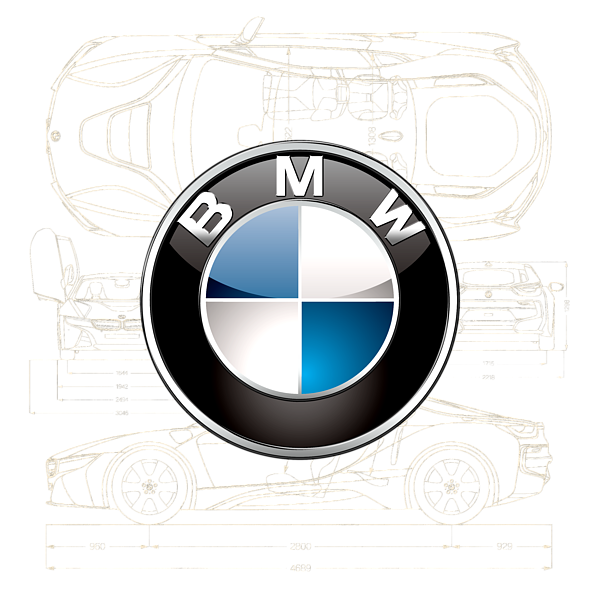 Bayerische Motoren Werke AG (English: Bavarian Motor Works), commonly known as BMW or BMW AG, is a German automobile, motorcycle and engine manufacturing company founded in 1916. BMW is headquartered in Munich, Bavaria, Germany. It also owns and produces Mini cars, and is the parent company of Rolls-Royce Motor Cars. BMW produces motorcycles under BMW Motorrad. In 2010, the BMW group produced 1,481,253 automobiles and 112,271 motorcycles across all its brands. 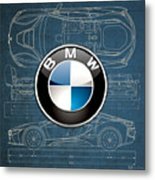 BMW is part of the German Big 3 luxury automakers, along with Audi and Mercedes-Benz, which are the three best-selling luxury automakers in the world. All women's v-neck t-shirts ship from our production facility within 1 - 2 business days of your order.